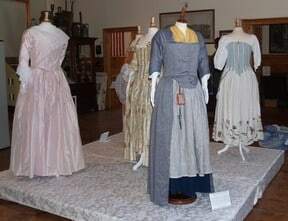 Sewing by hand, using 18th century reproduction fabrics and constructing garments in the 18th century manner are the trademarks of two 21st century Colonial seamstresses who work diligently to accurately reproduce colonial clothing in every detail. Hallie Larkin and Stephanie Smith have on display several of their recreations including a set of handsewn stays (the undergarment of the colonial woman), a linsey-woolsey gown, a silk gown worn a la Polonaise and the formal gown (robe à la Française) of the 18th century woman known in the colonies as a sacque or sack. Finding the fabric is the first challenge in creating true replicas and no stone is left unturned on the quest for the best possible textiles in the marketplace. Every detail is important, down to the threads used in each garment as well as the techniques of assembling each garment. 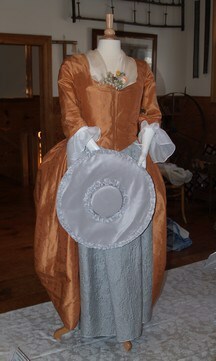 Hallie and Stephanie teach classes on reproducing 18th century clothing at various sites around New England and most frequently at Minuteman National Park. The Westford Historical Society extends thanks to both Hallie and Stephanie for providing this striking and educational exhibit. It was in the museum mid-January through February 2011. ©Westford Museum & Historical Society. All rights reserved. The Westford Museum is open most Sundays of the year from 2:00pm to 4:00pm. Directions, hours and closings information.